It’s been two months. I just finished watching a movie and I’m seriously contemplating what I even have to write about. I mean there’s so much I could write about, but it’s almost not worth writing about the past. My new goal is to try and live in here and now. So right now I’m lying in my bed with perhaps the most comfortable blanket (including my blanket from home) and pillow I have ever had. Well it’s not exactly mine because I am currently living with a Gazda and they own my linens. In two weeks I will be packing my belongings for another change. I sit here now and I have no feelings about this other than the excitement for change. It’s an often contradiction I have with myself. Since I arrived in Romania I have wanted a home, as a matter of fact I have had many homes. So now it has evolved into I just want so desperately for a place to just be consistent, but yet I love and long for constant change. Actually at the moment I am obsessing about organizing all my stuff, where I will pack this, where I will put every single item in my new house. All the while longing to just stay put. The countless hours convincing myself how to make this entire life possible has not been in vain. It might be seriously true that as a volunteer you gain more out of the experience than anyone else. I have been in Romania for less than a year and I have seen and experienced more than I ever imagined. More importantly, I have been tested more than I ever imagined, but just like my life before coming here I would not change a single thing. In the last two months I have been very busy with many things, but I’ve traveled a lot. I spent time in Arad for Thanksgiving. A group of volunteers made a massive feast for our Romanian friends. I made my way to Blaj to visit some fellow volunteers before our week in Sibiu for IST. Returned to Timisoara for two weeks before Christmas. I can’t explain how many times I listen to Mariah Carey’s “All I Want for Christmas” track in those two weeks. Every single student of mine knows the song by heart. I was so looking forward to Christmas! I traveled with another volunteer to Targoviste (or near by) to spend the holiday with our Romainians. We ate and ate and ate. After Christmas, due to no hot water, we made our way north to Comanesti for a few days. This is where I witnessed the festival of bears. People parade through the streets, dressed in real bear hides, reenacting a ritual where the bears were hunted and killed. After a few days there, a group of us spent New Years in Bacau. Hands down an awesome time spent with fellow volunteers, and what can I say the only open place New Years day: McDonalds. Memories I will never forget. Finally I made it home to Timisoara. 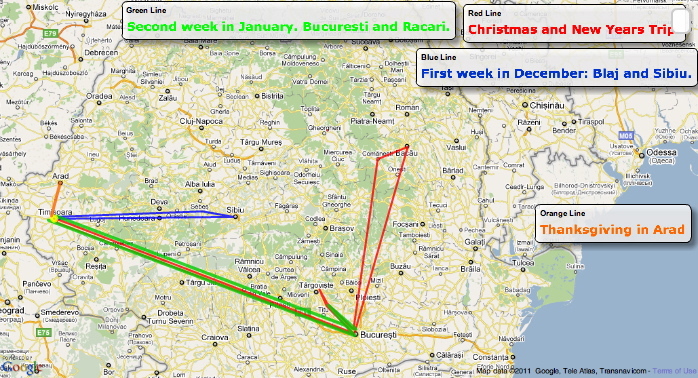 A week and a half later I was back in Bucuresti and Racari. I always said I love to travel. Looking forward… ROME in 12 days. I got my bike back. More to come about the story of my bike.